This morning’s New Japan Pro Wrestling event is another Road to Power Struggle event held in Korakuen Hall. As with any New Japan card, there’s plenty of multi man tags that probably aren’t interesting at all, but at least will build to future matches. 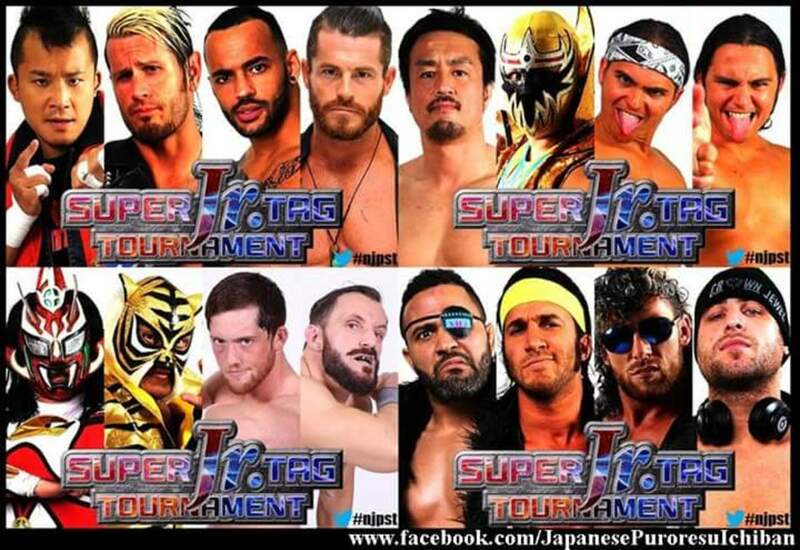 We’ll also be seeing the continuation of the Super Juniors Tag Tournament as The Young Bucks take on the new team of Matt Sydal and Ricochet, and in the main event Roppongi Vice take on champions reDragon. Pretty short, but was fine. Komatsu looked great in doing transitions, he’s really fluid in the ring. He made Finlay tap out to a Boston Crab. Another solid tag match. Dorada did a cool tope on the outside, taking care of CNJ while Shibata and Makabe went at it on the outside. Robinson escaped the shouten kai but Goto took him down and tapped him out with a seated armbar. Shibata and Makabe had a pull apart brawl after the match, so they seem to be teasing something between them. Timesplitters defeated Chase Owens and Kenny Omega. Good match. Nothing out of this world, but perfectly fine. Timesplitters are just so fine tuned in synchronicity, it’s great. Omega was about to strike one of the Timesplitters when they moved and Owens was struck. Kushida put him in the hoverboard lock as Shelly gave Owens the Automatic Midnight for the win. Omega ground and pounded Shelley after the match and had to be pulled apart by referees. Another good match. Some comedy early, but got into a groove once all of that was finished. Nakamura and Anderson worked a lot of the match together. Yoshi-Hashi made a great comeback. Nakamura tried to interfere but Anderson laid him out with a gun stun from the top rope. Yoshi Hashi made a comeback again but Anderson cut him off and pinned him with a gun stun. Also a good match. Everyone got time to work with one another, and as usual it was all good stuff, though it’s also stuff you’ve seen before. Okada was about to lay out Taguchi with the rainmaker but Taguchi countered with a hip attack. Okada eventually countered with the dropkick, elbow, then pinned Taguchi with the rainmaker. Great match, probably one of the best matches in this tournament so far. Sydal and Ricochet is the fresh shot in the arm that this division needs. Both guys are just great, and so are the Young Bucks in terms of knowing how to get a crowd going. Ricochet had the win at one point with a springboard 450 splash but the ref was pulled out of the ring. Hall laid Ricochet out with a lariat allowing the Bucks to get the advantage. Ricochet did an amazing senton, leaping over the top turnbuckle that took out Cody Hall. Bucks tried to mount a comeback, but Ricochet and Sydal came back and they hit the double shooting star press for the win. Excellent match, this surpassed the previous match as it was just great stuff throughout. Just excellent work from both teams. reDragon looked super crisp in everything they did during this match. RPG Vice were just as good and held their own. Crowd was super into it due to the work from both guys and helped the match a lot as well. Berettas leg was worked on early in the match and was used by both members for reDragon for submissions. Fish got him in one but he escaped, then hit the Dudebuster for a nearfall. O'Reilly and Romero got into it in a great exchange, with Romero getting the better of it and took him out with a suicide dive. Beretta then hit the Dudebuster again and Romero assisted with the dropkick for the win. Romero cut a promo promising they’ll be the next IWGP Jr. tag team champions. He then addressed their opponents at Power Struggle, Matt Sydal and Ricochet, saying they’ll go down 1, 2, 3. That closed out the show. Definitely watch the last two matches as they were both great.